Jeep Wrangler JK Locking Center Console. Fits JK with Automatic Transmission Only. 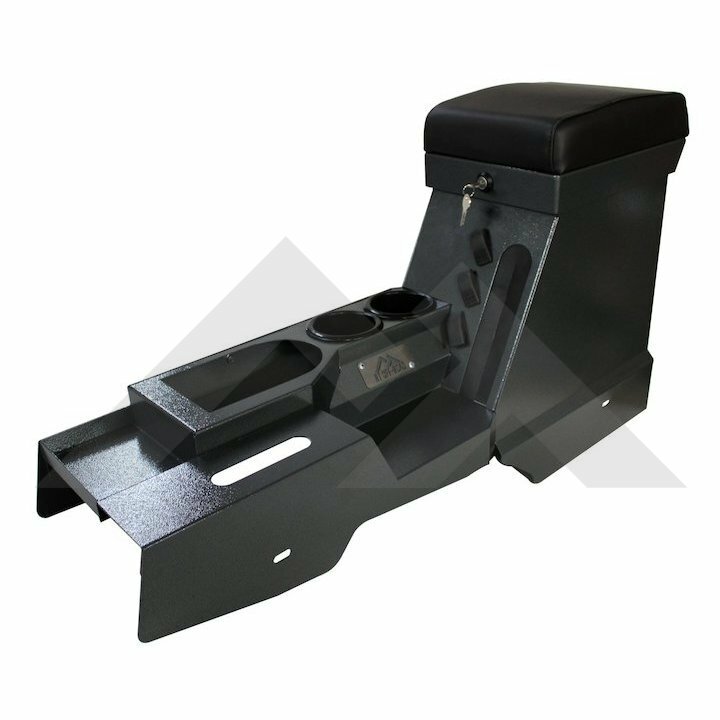 Gray Locking Center Console; Finished In a Rich Hammer Finish Gray Powder Coat. 2007, 2008, 2009, 2010 Jeep Wrangler JK Center Console. Features 2 Front Cup Holders, 2 Rear Cup Holders, 3 Rocker Switches, 1 12V Power Socket, 2 Round Switches, 3 Fuse Holders, a Locking Console Compartment With An Armrest Pad Covered In Marine-Grade Vinyl, Stainless Steel Hinges; Constructed of 16-Gauge Steel; Riveted Construction; Pre-Wired; Bolt-In; Uses OE Hardware.